I got this hand vacuum to clean my dogs hair in the couch. It works perfect! It is a very strong corded hand vacuum. It is a hand vacuum lighter. It not heavy. I highly recommend this product. Clean your home from top to bottom with this lightweight SharkRocket vacuum, ergonomically designed for comfort and versatileenough to clean faster and better in every corner, nook, or crevicein your house. This Shark Rocket vacuum features 'No Loss ofSuction' and swivel steering. This is great for cleaning stairs, furniture, cars, and quick clean ups. I love this Shark Hand Vac. I purchased because I have 3 corgis that shed horribly. This hand vac does the job and the attachment for the furniture is great. I would recommend this vac to anyone, dogs or not. I also like the corded vac. The cord is long enough on it, I can vacuum my living room furniture without having to ever unplug it. I'm so glad I purchased the Shark Rocket and got a great price at Overstock. Very happy with purchasing the Rocket corded hand vac. No need to worry about the battery life and keeping it charged. The length of cord is great. It comes with three attachments and the hose for extension. The pet attachment can only attach to the vacuum itself and not the hose. The suction is strong and does well gettting the pet hair! One feature on the pet attachment is the continuous movement of the head as you vacuum the stairs-The head pivots up and down which is a very convenient feature. Glad I made the purchase! The vacuum works well, though when using the hose in one hand the base must be held onto with the other hand as it is heavy and so tippy that it will slam into the body or smash toes. 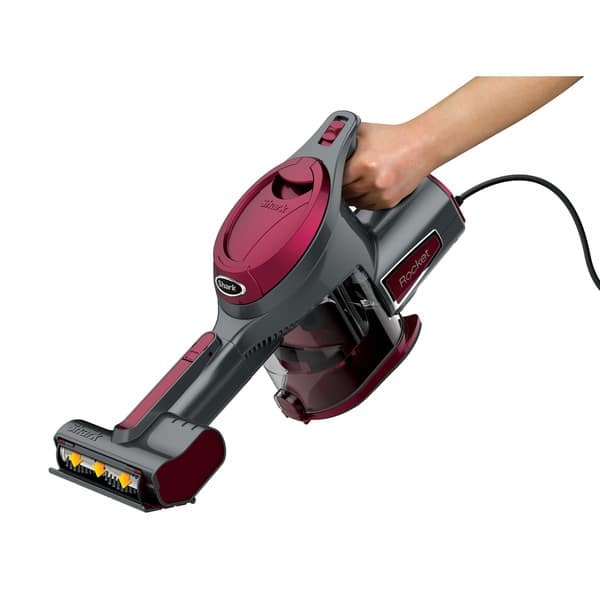 The Shark HV 292 corded hand vac was actually bought as a pair of two. One is for myself and one is for my daughter. We both have pets and the Shark is able to get up pet hair in tight places like stairs and on upholstered furniture. It has great power and the many attachments make it easy to use. Needed a hand vac for my mattress and upholstered furniture. Delivery was quick &amp; the vac was packaged very well. Pros Compared to other hand vacs I've used over the years, this has exceptional suction &amp; it's a breeze to clean. Although a little weighty the vac is easy to handle. The cord could be a tich longer but it's doable. To be honest I'm still trying to figure out the attachments - so far I've only used the crevice tool which works well on my furniture. The hand vac housing is plastic but not flimsy. Yes it's noisy, but better than pulling out my vacuum and risk my downstairs neighbor complaining about noise - again.Cons None for me. All in all I'm very satisfied with my purchase and highly recommend. I order shark HV292 Rocket a couple of days ago and I received it today I love it very powerful it came with all that attachments...its Worth the money my son saw it and he once to get one..
Great vacuum very strong and can get the hard to reach areas easy. We use it mostly on the steps in our home cause it’s very lightweight. OMG what a job saver great light weight. Great attachments and good power. i like it great buy ////////////////////////////////////////////???? I desperately needed something to help me get the pet fur off of my stairs and this worked perfectly. It has a great deal of power for such a small vacuum and I was pleased with how light weight it is. It's a plug in so no need to worry about running out of power half way through your cleaning. It is so powerful and easy to use! Wouldn't want to be without it! Very handy and light for cleaning cat hair off the furniture or cleaning the vehicle. Good suction, just wish some of the attachments were smaller so it would fit into smaller spaces. I liked this vacuum cleaner because it is compact and you can vacuum the stairs. I am pleased with my purchase. nice but a little awkward when using it for certain functions such as stairs. Also you need a strong wrist. I finally found the perfect tool to clean my carpeted stairs. I have to sets of full length carpeted stair cases and I can clean each one thoroughly in less than 10 minutes with this shark hand vac. It has a strong brush and great suction power. Also very easy to empty. I love that this sweeper is compact, but also has strong suction. It's perfect for small jobs or quick pick-ups! I bought this hand vac as a gift for my father. I thought it would be nice to use on the stairs and also in his car. He seems pleased with it. It’s relatively light and has good suction. So far we’ve only tested it in a small area but it seems to pick up dirt well. "How is it for cleaning up pet hair?" I have 8 little doggies and, so far, so good. I like it a lot for pet hair. "Is this the one with the Motor upfront ? The Shark Handheld Rocket with motor upfront? My son told me to get the Right one." Hello Bettye C., according to the manufacturer, this item features a bypass motor so that debris does filter into the motor. Thanks for shopping with us! Good value and compact size.